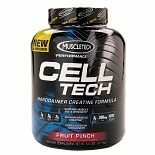 Shop Muscletech Cell-Tech Pro Series Creatine Fruit Punch (96 oz. )96 oz. $5599$55 and 99 cents$0.58 / oz. One dietary supplement that provides extra creatine, an amino acid normally found in seafood and meat or produced by the body in small amounts, is Muscle Tech creatine. Bodybuilders often take creatine in order to boost their performance, but anyone who is athletic or who exercises regularly may benefit from this supplement. Creatine supplements, such as Muscle Tech creatine, help boost the levels of this important amino acid in the muscles. Muscle Tech creatine is available in caplet form and as a powder. Using creatine caplets is a convenient way to take this dietary supplement because these caplets are extremely portable. Creatine powder offers a higher level of control, since you can precisely measure out the exact amount of powder you want to consume. Some versions of creatine powder are flavored, and some have additional ingredients, such as the omega-3 fat ALA and the sugar dextrose, to help boost the activity of creatine in the muscles. Many athletes take Muscle Tech creatine after a workout to help replenish the muscles and allow them to use the ingested creatine to help build and repair muscle tissue. Some people also take Muscle Tech creatine before a workout, and this may also be beneficial. It is important to remember that creatine supplements should not be taken continuously. Instead, it should be taken in cycles. Many people choose to take a daily dose of Muscle Tech creatine for four weeks at a time and then stop taking it for four weeks before restarting the cycle. Creatine supplements can be used in conjunction with other muscle-boosting nutritional supplements, such as amino acids.